Paprika is a sweet but sassy relative of the chili pepper. Also known as sweet red pepper or pimento pepper, the paprika is larger and much milder than the chili pepper. Organic Ground Paprika adds warm, natural color and mildly spicy, pungent flavor to everything from soups, stews and grains to a variety of hors d'oeuvres. 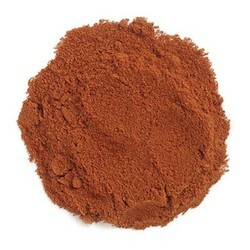 Paprika is graded according to classes: Spanish paprika has three grades (sweet, semi-sweet, and hot), while Hungarian has seven (or more) classes. For mildest flavor, choose the Spanish variety; for a bit more more pizzazz, go Hungarian.